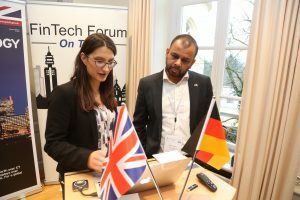 In partnership with the Department of International Trade, the British Embassy Berlin and Frankfurt Main Finance, TechFluence organized the event FTF On Tour | UK FinTech meets Germany on 22nd March 2018 at Haus Metzler in Frankfurt am Main. 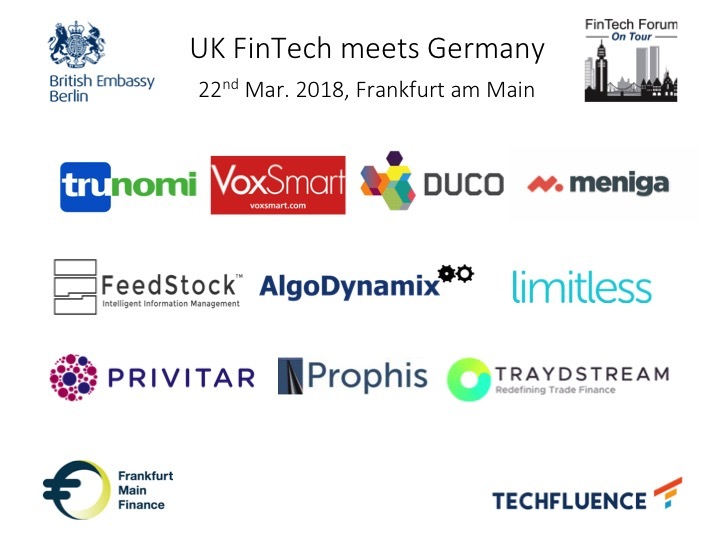 The event brought together 10 top-notch UK FinTech startups addressing “real and present” challenges and opportunities for German banks, as well as a lively panel discussion, a fireside chat and expert sessions. The UK Fintech startups selected to pitch were mainly from the enterprise software space. 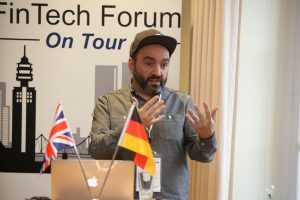 Mr. Michael Mellinghoff (MD of TechFluence UK) and Mr. Samarth Shekhar (Co-Founder, FinTech Forum) kicked off the event – the 17th since the inaugural FinTech Forum in November 2013. The 260+ startups selected to present at FinTech Forum / On Tour events till date have gone on to raise over €320m and resulted in exits worth over €300m as of end of 2017. 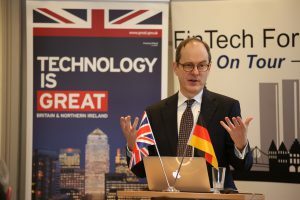 The welcome address was delivered by Her Majesty’s Consul-General for Hessen, Mr. Rafe Courage, who outlined the status of London as a pre-eminent global financial center, and the need to further collaboration around FinTech and financial services across the Channel. Then followed the session “Frankfurt post-Brexit” by Mr. Hubertus Väth, MD of Frankfurt Main Finance, outlining the vision of as the hub for financial services in the Eurozone and as a bridge to London after Brexit. Launching the startup pitches – each startup had seven minutes to present and three minutes for questions and answers – was Uzair Bawany of Traydstream. Traydstream is designed for banks and corporates involved in the provision and receipt of trade finance, offering Software as a Service (SaaS) that digitises and automates the critical processes of transaction document scrutiny. Traydstream have uniquely digitised the tribal knowledge of international trade rules and compliance requirements to offers complete transaction management and end-to- end document checking on-cloud or on-premise. They have been nomiated for the Global Trade Review (GTR) Leaders in Trade Awards 17, FSTech Awards etc. Second on stage was Trunomi presented by Adrian Sturley. Trunomi provides customer consent and data rights management technology which enables businesses to request, record and immutably prove the legal basis for processing personal data. They enable businesses to comply with EU GDPR, ePrivacy Regulation and global data privacy regulations by putting in place auditable immutable records to prove lawfulness basis of processing of customer data. They have won the KPMG & Monetary Authority of Singapore Global Fintech Award, Regtech Markets Spotlight Award, Barclays Rise FinTech Startup Award. Third up was Privitar, presented by Kristin Waeterloos. Privitar is an enterprise software company headquartered in London, with a global client-base across North America, Europe and Asia, leading the development and adoption of privacy engineering technology enabling our customers to innovate and leverage data with an uncompromising approach to data privacy. Privitar’s mission is to promote and facilitate the ethical and safe use of valuable data assets. Using leading privacy engineering techniques, they help companies get maximum value from data while preserving customer’s privacy. They raised $16m in funding from Partech Ventures, CME Ventures and Salesforce Ventures in 2017. Previous investors include Illuminate Financial. Fourth to present was Charlie Henderson of Feedstock. For busy financial services professionals, FeedStock automates time-consuming, non-revenue generating tasks such as logging consumption of research for MiFID II, mapping productivity and inputting data into CRM systems. Unlike competitor products that require manual work and reconciliation with third party data, using the latest methodologies in AI FeedStock’s solution is completely automated and generates an accurate, consistent and complete dataset. Feedstock was selected as one of the Most Influential Fintech Companies for 2018 by The Financial Technologist, and recently announced a collaboration with IHS Markit. This was followed by a lively panel discussion Costs, Competition, Compliance & Growth – Can FinTechs Help Deliver Banking 2018? 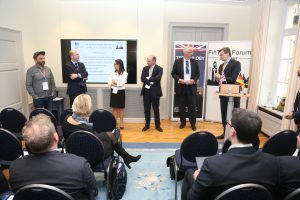 The panel, moderated by Dr. Martin Deckert, Supervisory Board of niiio finance group – discussed what (enterprise) FinTech firms can offer to address “real and present” challenges and opportunities facing German / Eurozone banks. The panel brought in valuable perspectives from banks (Ms. Lucie Haß, Landesbank Hessen-Thüringen and Mr. Christian Nehk, Barclays), a global accelerator (Mr. Nektarios Liolios, Startupbootcamp FinTech), and an ex-FinTech founder and investor (Mr. Steffen Seeger, Advisory Partner, Digitalplus). The keynote by Sir Sebastian Wood, British Ambassador to Germany, summarised the state of Brexit discussions. 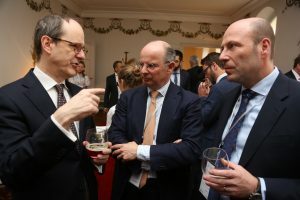 Dwelling on the potential win-win for both London and Frankfurt in the context of European Financial Services, he stressed the need to build bridges between the cities (including via events like this). 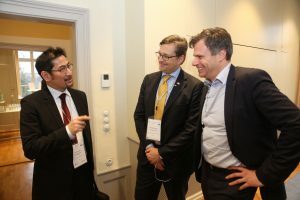 He also answered several pressing questions from the audience on the challenges of a potential Brexit for the FinTech sector. After the networking lunch came the presentation Market Entry Germany – Experiences of Funding Circle by Ms. Panni Morshedi (Head of International Expansion, Funding Circle). The fireside chat with Ms Nancy Kalogeropoulou (Country Manager UK at Fidor Bank) revealed the peculiarities of the German market, unexpected similarities between markets, and lessons learnt from both the perspectives and approaches – Funding Circle entering Germany via the acquisition of ZenCap, and Fidor Bank expanding organically into the UK. This was followed by the second round of startup pitches. Meniga, presented by Michal Bezak, helps financial institutions who want to increase engagement via their digital channels and find new revenue sources (by monetising data). Meniga offers white-label Digital Banking and Marketing solutions that have helped more than 60 financial institutions in over 20 countries and with over 50 million end-customers. 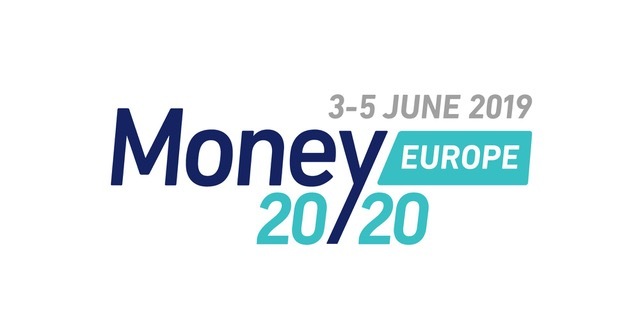 Meniga was awarded “Best of Show” in 2011, 2013, and 2015 at Finovate Europe, and has been on the The European FinTech50 list of 2014, 2016 and 2017. This was followed AlgoDynamix, presented by Mike Hamm. AlgoDynamix risk analytics provide hours or days advance warning of major directional market movements. Unlike other solutions, the underlying technology does not require any historical data or knowledge of any previous disruptive events. Their Global customer base including Tier 1 and tier 2 asset managers and investment banks (including major reference customer in Frankfurt). 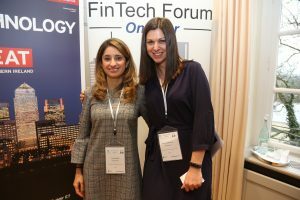 The company is backed by institutional investors including Amadeus Capital Partners, was recently nominated as one of the UK’s most disruptive technology companies, and won the top prize (Risk Category) at the UBS Future of Finance challenge. Next up was Vincent Him presenting Duco. The proliferation of data formats and volumes are causing big issues in enterprises, who spend billions dealing with the resulting problems. Duco provides innovative technology that enables financial institutions to normalize, validate and reconcile any type of data in Duco’s cloud, providing firms with on-demand data integrity and insight. Their SaaS solution, Duco Cube, is used by some of the largest companies in the world, including international banks, exchanges, asset managers, hedge funds, administrators and service providers. 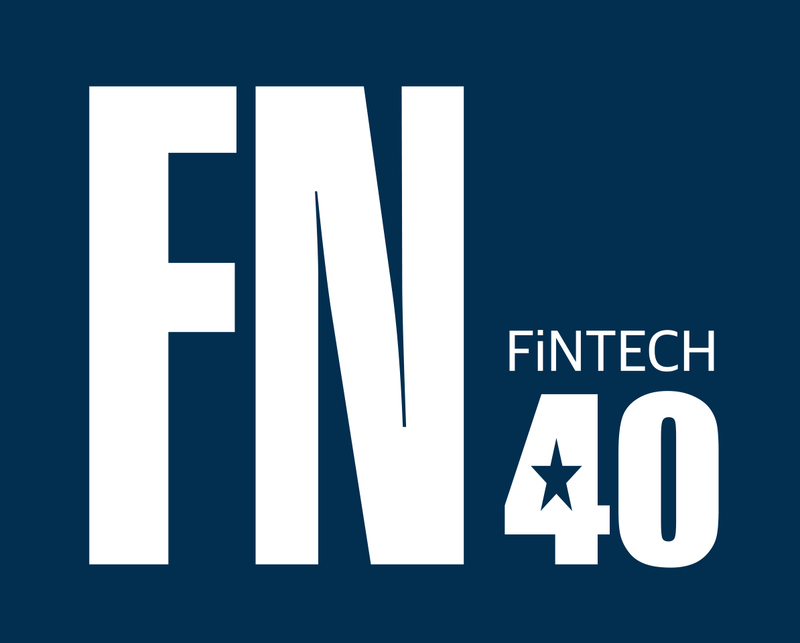 Awards include Deloitte UK Technology Fast 50, Waters Buy Side Technology Award for Best Reconciliation System etc. He was followed by serial entrepreneur Oliver Blower, presenting VoxSmart. For regulated Financial Institutions with end-use who want to use their mobile devices, VoxSmart offers VSmartTM the “world’s first unified mobile surveillance platform”. This is also relevant for Mifid II call recording requirements. The solution has been a winner at HFM (three years in a row) and Banking Technology awards. 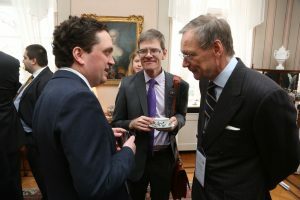 After a coffee break, Mr. Thorsten Heinen (Director, Bankhaus Metzler) provided an engaging history of the location – the Haus Metzler in Frankfurt-Bonames, dating back to 1865 – owned by the Metzler family which founded Bankhaus Metzler in 1674. The penultimate startup on stage was Limitless, presented by Judit Bogos from Hungary. For financial institutions (banks, insurers and asset managers) who want to attract and offer relevant product for Millennials, Limitless offers a white-label, micro-investment app. Unlike Acorns, Moneybox or Digit, their product / service is white-label (B2B), goal-based and transfers a % of every card transaction into a savings/investment account instead of just rounding up. Furthermore, they provide advanced analytics of our end-users including purchase intent. They have launched a B2C, savings only version in the Netherlands (not core business, no marketing budget) with a few hundred users, have one pilot starting in April in Finland and a full implementation in Poland. They won the most promising startup by the VC award from BNP Paribas, and were the Top 3 Most innovative banking solution at the European Fintech Awards. The final startup on stage was Prophis, presented by Charles Pardue. For originating and investment groups with exposure to portfolios of granular assets (e.g. loan portfolios, leases) who seek better insights and easier use of complex, interconnected datasets, Prophis offers a suite of products that begin with a new approach to integrating multiple disparate datasets using graph databases, executed through an efficient parallel computational dependency graph, leading to vast computational capabilities for markets. Unlike most other alternatives to achieve similar results, Prophis’ technology is at once straightforward to apply without becoming a black box. Prophis is a winner of the Dassault Systemes 3D Fintech Challenge. 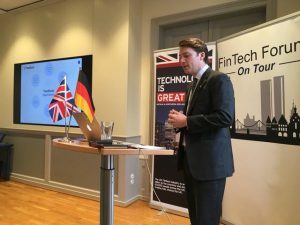 The final section of the event comprised expert presentations that provided a comprehensive overview of the German financial services and FinTech landscape, and how UK FinTech innovators can enter the market. 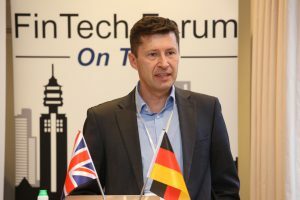 The session German Banks’ FinTech Adoption and Selling into the DACH Financial Sector by Mr. Frank Schwab (Co-Founder, FinTech Forum and CEO of GIZS) outlined the approach for startups looking to enter the German market: the opportunity areas, the steps for selling to German banks as well as the associated timelines and patience involved for building the essential trust and relationships. 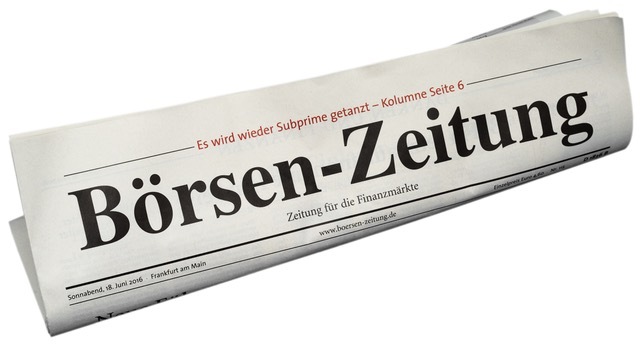 In her session FinTech Ecosystems in Germany, Ms. Jana Koch (Head of comdirect Start-up Garage), covered highlights from their research report comdirect FinTech-Studie. Apart from an overview of the German FinTech scene, VC investments and key FinTech hubs, she shared valuable insights based on primary research on how the market is expected to develop in the next five years, the threat from GAFAs (Google, Apple, Facebook and Amazon) etc. Last – but not the least – was the session from Dr. Anna Lucia Izzo-Wagner and Mr. Till Otto, both of Taylor Wessing, covering the regulatory requirements for FinTech firms entering the German market. After a note of thanks and concluding remarks, Mr. Michael Mellinghoff invited the audience to networking drinks. 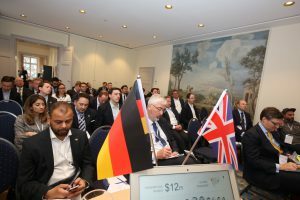 The event was arranged for 10 selected Fintech startups from UK and 40+ financial institutions from all over Germany.